This is a guest post written by Lauren Wiseman. Want to contribute? Check out the 2018 publishing calendar. Most of the time, newly established coaches feel like they’re fighting an uphill battle. After all, their competitors have more money, more experience and a battle-tested infrastructure, which makes things seem like all odds are stacked against the little guy. However, there’s one thing that up-and-coming entrepreneurs and coaches have going for them. You see, the bigger a corporation becomes, the further they get from their target market. Once a business has grown enough, it will have to employ expensive analysts and agencies in order to understand the basic needs of their audience. This is that one shot that small businesses have against their much larger counterparts. Still, all of this is in vain unless you know how to conduct proper market research. Here are several strategies that you just might find handy. The downside of online polls, surveys and comments lies in the fact that you are denied the chance to study the non-verbal communication of your audience. Because of all this, industry events and Q&A sessions are probably your best chance of making face-to-face inquiries with your target niche. Even if you do your coaching remotely, like many coaches, it’s important to find ways to get feedback from past, current and prospective clients. Attend local events related to your niche, host events that are related to your speciality (in-person and on-camera webinars or teleclasses) and get your clients on Skype for video calls. The downside is a limited reach and a time-span that allows you to interrogate a fairly small sample of your audience, meaning you need to combine this method with some other techniques from this list. The next thing you should think about is using your social media accounts to learn more about your target audience. 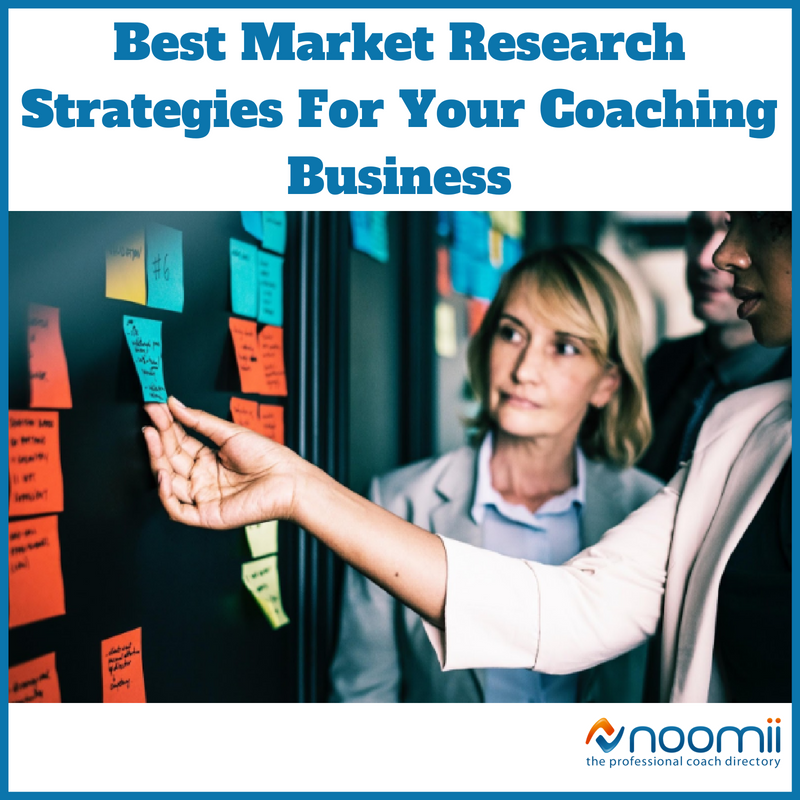 When you are gathering research, you don’t always need a comprehensive answer that goes into details about the pain points or goals of your ideal client. There are situations where you need an answer to a simple yes or no question. For the sake of authenticity, you need as many answers as possible, which is why you should leverage your social media accounts to gain small tidbits of insight from your target audience. In today’s technology age, you have to keep in constant constant with your target market in order to stay competitive and the simplest way to do this is through social media. Create polls and quizzes on your coaching business Facebook page, promote webinars and events where you can learn more about your followers, ask questions on your Instagram story - try different methods to engage your audience and learn from them. Two main reasons why this is so effective is because you A) have a much greater reach and B) give your audience a low-effort method of answering you. The latter is sometimes achieved through the help of micro-interactions. One of the biggest obstacles in gathering information from a survey lies in the fact that you can never trust the validity of the information. For instance, websites who place a survey as a popup which blocks the content usually give adverse results, seeing as how people answer the questions on random in order to bypass this obstacle. Here lies the biggest problem in the perception of your survey. For you, it’s a business tool of the utmost importance and to your audience, it’s merely an obstacle to be overcome. The best way to avoid having this problem is to look into paid surveys online. In this way, your audience has a financial incentive to be careful and honest. Words can be deceiving and there are a lot of reasons why the rating system you displayed under your content might be faulty. On the other hand, by giving your target audience a chance to show you what they want, you can get a much simpler and safer way of getting the answers you need. Through A/B testing, you can present your audience with two versions of a feature and allow them to make their own choice. Then, you can see which version gave the most favorable results and permanently implement it into your design. The downside of this technique lies in the fact that it gives you only “which” and not “why” choices are made. In the short-run, however, this is more than enough. Giving away promotional items is another way of testing your audience and observing their reaction. It will also create an emotional connection with them, which will be an important part of your marketing strategy. While it may seem counterintuitive to share your findings with your competitors, sometimes, you just have to compare notes. Poles and surveys that you offer might differ, which means that their results could potentially unveil blind spots that are a side-effect of your research. By collaborating, you both stand to improve your coaching services, which, in the long-run, benefits all involved parties (customers included). At the end of the day, this notes comparison also helps you with networking and even creates a possibility of turning a potential rival into a valuable ally (even asset). Just like the first strategy we discussed on this list, this also gives a boost to your networking efforts. Regardless of your niche or the type of coaching service you offer, your success depends on your ability to ask all the right questions (outside your sessions, as well as in them). Nevertheless, how you ask something is almost as important as what you ask. These five strategies will provide you with all the channels you need in order to get the answers your coaching business so desperately needs.